This 1 ft, null modem cable has 9-pin connectors on both ends for connecting the data logger's RS-232 port to a peripheral's RS-232 port. An interface such as the SC105 or SC932A is typically not required. The 18663 is a null modem cable that can connect the data logger's RS-232 port to a peripheral's RS-232 port. An interface such as the SC105 or SC932A is typically not required. Compatible peripherals include spread spectrum radios, digital cellular modems, CSAT3 sonic anemometer, and MD485 multidrop modem. Is there a pinout diagram available for the 18663? Is there a 3 ft or 6 ft version of the 18663? No. Campbell Scientific only offers the 1 ft cable in this configuration. Is the 18663 full-handshake compatible? Yes. 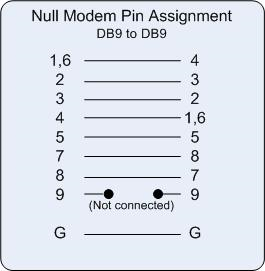 The 18663 is a standard null modem cable that may be obtained from another vendor.